HARD: AS HARD AS IT GETS/ F.Y.C. Last week, I stretched our Hard theme as a way to discuss the founding of a new jazz club in my hometown. Today, I’m going to stretch it again to write about what I did last weekend—listening to great music outdoors at Clearwater’s Great Hudson Revival, or, as I think most people call it, the Clearwater Festival. Because not only is it hard to put on a two day, multi-stage outdoor music, environmental and progressive festival, it is actually pretty hard to attend—but well worth the effort. I’ve written about Clearwater experiences before, but I’ve never really focused on the whole experience. The event started in the mid-sixties, as Pete Seeger held fundraising concerts to raise money to build a boat, to highlight the need to clean up the Hudson River. The sloop Clearwater was launched in 1969, and began its educational mission, as part of a larger charitable organization. In 1978, the first large-scale event was held at Croton Point Park, right on the river, and the “Great Hudson River Revival” name was coined. Unfortunately, ten years later, pollution from the park’s landfill forced a move to a nearby, inland college campus. My wife and I went to the festival one year during this period, with our young children, and my two strongest memories are that the one musical act we wanted to see was Dar Williams, and that while we were at a playground with the kids, Pete Seeger appeared with his banjo and just started playing. The festival returned to Croton Point in 1998, but soccer obligations and the fact that the festival is usually on Father’s Day, kept us from returning. In 2010 Steve Lurie began booking the festival, and started to bring in bigger names to perform. When the 2011 lineup was announced, including many favorites including the Drive-By Truckers, Martin Sexton, Indigo Girls, Josh Ritter, Suzanne Vega, Jorma Kaukonen, Billy Bragg, and Dar Williams, among many other great acts, we got the courage to tell my mother that we were not coming for the traditional Father’s Day family event, and instead went to the festival. We’ve gone every year since, except for last year, when they cancelled it to focus the organization's efforts on rebuilding the sloop. I can only imagine how hard it is to get this event off the ground. Acts need to be booked to fill as many as eight stages, in genres ranging from the traditional folk that is at the root of the festival, to rock, dance and folk music from cultures around the world, story tellers, and other performers. There are lots of jugglers. The site needs to be set up, vendors engaged, employees and volunteers trained, and the various activist booths and environmental education booths that are a hallmark of the festival have to be set up and staffed. The organizers need to make sure that the attendees can get to and from the site, there’s a campsite that has to be organized, the performers need to be taken care of, and the sound systems have to deal with the vagaries of outside shows, including heat, rain and dust. There’s a huge group of “access” volunteers to make sure that people with mobility issues are able to enjoy the weekend, and, I think, an even larger group of “Peacekeepers” to make sure that the thousands of people all get along. Then, there is breakdown and clean up. And I’m sure I’m leaving something important out. But, as I noted, it is also sort of hard to attend this, or I suspect, any outdoor festival (my experience in the torrential rain at the Newport Folk Festival is discussed here). First, you have to get there. Our first year, we drove the 10 miles from our house to the site, only to sit in horrible traffic. We started taking the train after that. You need to bring in chairs, a cooler with food and beer, blankets and other items. Then you have to load all of this onto a school bus not designed for large adults, unload it at the end, then schlep everything to the stages. As I mentioned above, the festival now has eight stages, but we usually spend most of our time at two-the largest Rainbow Stage, and the second largest, Hudson Stage, which literally abuts the river. The Sloop Stage also often has good music. I’ve rarely, if ever, ventured to the Dance Stage, Story Grove or Family Stage, and skipped the new Workshop Stage this year (despite the fact that there was some good stuff there). Last year, I visited the Circle of Song to support my wife’s decision to join in the singing, but not this year. So, you are often forced to make hard choices as to which of the many simultaneously performing acts you will see. Sometimes we run between the stages catching partial sets. Then, there is the weather. Usually, it is hot, and there isn’t much shade at the Rainbow Stage. That’s what we got on Sunday. Often it rains, sometimes torrentially, like two years ago, or steadily, like this year’s Saturday in the early afternoon. By Sunday evening, I’m usually beat, and my wife sometimes leaves earlier than me. But it was well worth it. Here’s what I saw this year: On Saturday, we arrived early, got ourselves a nice spot at the Hudson Stage, then wandered around checking out the activist and vendor booths. At 11, we were back in our seats for a tribute to Pete and Toshi Seeger by mostly older folk and blues musicians, including David Amram, Tom Chapin, Guy Davis, Holly Near and Tom Paxton. Next up on the Hudson Stage was Joan Osborne, performing Bob Dylan songs, in advance of her soon to be released album of Dylan covers. During her version of “Tangled Up In Blue,” when she sang the line “Some are mathematician,” someone up the hill to my left, presumably a mathematician, gleefully cheered. No carpenter’s wives did the same. After Osborne was done, we walked over to the Sloop Stage to catch a little of Guy Davis’s excellent folk/blues set. But then it was time to see Toshi Reagon and Big Lovely, one of the true highlights of the weekend. Reagon, who is Seeger’s goddaughter, and named after Toshi Seeger, has performed at most, maybe all, of the festivals. She is the daughter of civil rights activists and former Freedom Singers Bernice Johnson Reagon (also a founder of Sweet Honey in the Rock) and Cordell Hull Reagon, and comes by her musical chops and political activism naturally. I can’t find a video of her from this year, but here’s one from 2012, also on the Hudson Stage, that gives an idea of how powerful a performer she is. Then came Los Lobos, who I have seen great, and I have seen not so great, and when they took the stage without singer/guitarist Cesar Rosas, I was worried. But they did a fun, rocking set. The cool night ended with the hot sounds of Lake Street Dive, who are just an incredibly talented band. Great songwriting, strong musicianship and powerful, charismatic singing. It was an exhilarating way to end the long, wet day. Then, back on the school bus, to the train, to Tarrytown and a well-deserved hot shower. We were up again early on Sunday, packed our cooler, and decided to drive up, hoping that we wouldn’t get caught in traffic on the way up. We didn’t, and again schlepped our stuff onto the school bus which took us to the site. It looked to be a nice, hot day, but the forecast was calling for a chance of thunderstorms in the afternoon. We set up at the Rainbow Stage, walked around some more, until the music started at 11. Although I enjoy going to Clearwater to see musicians that I am familiar with, some of the fun is discovering someone new. Sunday, we started at the Hudson Stage to hear Jerrod “Blind Boy” Paxton, who is part African American, part Native American, of Cajun descent, and who is a practicing Jew (he has one Jewish grandmother, who he discussed during his set). Performing on piano, fiddle, banjo, guitar and harmonica (and the spoons), Paxton focuses on blues and jazz from the 1920s and 30s. I don’t have a video from his set, but here’s a video of part of a Black Banjo Music workshop he gave later in the day. I stuck around for a 50th Anniversary tribute performance of Sgt. Pepper’s Lonely Hearts Club Band by Brother Joscephus and The Love Revolution, a New Orleans style band. It was great fun, all the songs were well-played, but they didn’t try to sound like The Beatles. My wife ran over to the Circle of Song to sing a little, but came back to see most of the set. As he was trying to decide what to end with, someone in the audience yelled out “Castanets,” which he decided to play, and then joked that they were becoming a request band, “and you can catch us at the Holiday Inn.” During his set, the crew began to cover the speakers and other equipment, as the skies darkened. But, mercifully, it didn’t rain. They’ve announced a mini-tour (and I have tickets for the Tarrytown Music Hall show in October! ), and indicated that there might be a new album in the offing. During the show, the clouds rolled in and it looked like we were going to get, as Dar Williams noted, “the apocalypse.” But, again, we dodged the bullet. After the long weekend, and knowing that Monday was a work day, we reluctantly skipped out on Arlo Guthrie’s closing set (as well as Brother Joscephus’ performance at the Dance Stage) to load back on the bus, to our car. About halfway home, we noticed that the road was soaking wet, so it looks like the apocalypse passed just south of Clearwater. So, was it hard? It was. Was it worth it? Undoubtedly. Do I expect to be there next year? Yup. I remember that when I first heard the Blues Brothers do this song, I wondered why they were covering the Grateful Dead. Hard to Handle was a staple of their live shows in the early days of the Grateful Dead. Pigpen was the Dead’s designated blues singer in those days, and this song appeared to give him more trouble vocally than most. There are many concert versions that don’t say the best things about his voice if you listen too closely. Now at last I know why. Blues singing of the kind Pigpen did best is very different from soulful R&B shouting, as practiced by a master like Otis Redding. This is what Pigpen was trying for, and the Blues Brothers came closer. But there is simply no substitute for Otis Redding. In Redding’s hands, all of the power of this soulful boast is revealed, and you can hear why anybody would want to cover the song in the first place. But Redding delivers a performance that sounds so natural that the challenges of covering the song do not become apparent until you try it. This took me back in an instant. Forget what David Hepworth says about 1971, for a brief window 1989 was the year and well nigh wonderful, cranked up by songs like this. So history says the 80s were naff, does it? Since when was history driving along a road on a summer day, windows open, cassette player blaring this out, for the good and the education of all in earshot? I bloody love(d) the Fine Young Cannibals, from their intricate minimalism to the legs everywhere dancing of the guitarists on Top of the Pops. Life affirming and some. A candle that burnt only briefly, the Cannibals burst into my consciousness in about '84, with 'Johnny Come Home', instantly branding their template of rudimentary drums, spluttery guitar riffs, and whiffs of trumpet and keyboards, all topped by Roland Gift's, if you will, constipated style of vocals. The band had evolved from the break-up of the (English) Beat, with the guitar and bass players, Andy Cox and David Steele, eventually choosing Gift from a shortlist of 500. But no evidence of the ska so representative of that earlier band, pulling in influences from all over, as exemplified by the Elvis cover, Suspicious Minds, that gave their first international hit. A successful first album was later eclipsed by their second, and last, the Raw and the Cooked, discounting a remixed version and more greatest hits albums than they had actual albums. This was simultaneously more stripped back and more adventurous. Huge worldwide success ensued, with 2 U.S. number one singles in She Drives Me Crazy and Good Thing. I remember being slightly shocked by it when it appeared, the shock of the primitive sophistication taking time to imprint. Then? Virtually nothing. The odd charity song, the spin-off duo of Two Men, a Drum Machine and a Trumpet, featuring just Cox and Steele, whilst Gift set off to an expected glittering film career. That too faltered after a promising start. Since then occasional promises of a new start, never fully materialising. Gift has said he has merely been happy being a father to his children, possibly the truth. Two years ago he was recording new material. Did it ever appear? And of the other two, Cox seems to have more or less disappeared, Steele occasionally popping up as a producer or sidesman, notably on the debut of british R'n'B maverick, Gabrielle. 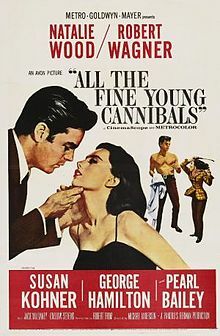 A brief word as to the origin of the band name, this being inspired, perhaps only by the title of 1960 movie All the Fine Young Cannibals, arguably a loose bio of jazz trumpet icon Chet Baker, starring Robert Wagner (as jazz trumpeter "Chad Bixby") and Natalie Wood. So maybe that explains all the trumpets!? I miss this band and I miss that time, with a slew of UK bands pumping out original music that has, largely, stood the test of time. One of the first cassette tapes I ever bought for my brand-new SONY Walkman back in 1982 was the Who's <Face Dances>. And now that I think back on it - the first 33 1/3 album that came with my new SONY "stereo" in high school was <Who's Next>. Guess I've always been a Who affecionado. And yes, I certainly chuffed at the Who's Super Bowl performance - more pleased that they were still able to do their thing at that age (more or less) than at their current abilities- after all, it's the show that matters for that kind of thing. As I previously noted, my departure from the US music scene at the end of the 70s probably played a role in why I missed the <It's Hard> album. Yes, I picked up on the songs Athena and Eminence Front, but I didn't buy the album in any form (vinyl or tape) - again, my bad. The 1982 <It's Hard> album comes just before their <Who's Last>, intended to signal the end of the road for the group (more or less true). The muscial style showcases the transitional stage between the late 60s and 70s (My Generation >>>Who's Next >>> Face Dances) and sounds an awful like <Face Dances> in many places. All said and done, I think my favorite Townshend is <Rough Mix>, with Ronnie Lane. Nothing I could find there about "Hard", How about "... easy .." @ 2:46?